HG Logistics LLC was established in September 2006. At first, there was just our general manager, who did all the sales, truck contracting, and dispatching. In addition, there was I and Shirley, who is now retired, managing the office duties–billing, payables, receivables, order entry, filing, etc. Now, seven and a half years later, we have 12 full-time employees, 2 part-time, and 2 outside sales agents. In the eyes of many transportation brokers, HG Logistics LLC is probably still considered one of the little guys. Nevertheless, we are proud of what we have accomplished thus far. Our goal has always been service and that we have realized time and time again. Last week, we were the recipients of a great honor. 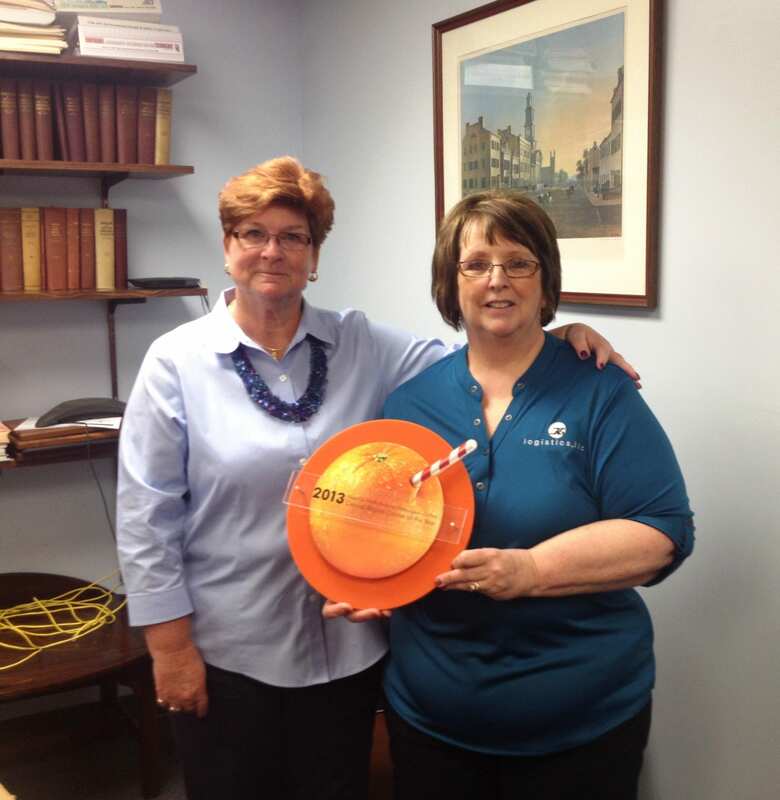 Donna Kemp, Tropicana Regional Transportation Manager (Midwest/Northeast) and Barb Hartenstein, Tropicana Shipment Planner, paid us a visit in order to present HG Logistics LLC with the 2013 Central Region Carrier of the Year Award. During her presentation, Donna mentioned that Tropicana has their big trucking companies that they use, but to her, the little guys are just as important. After all, the little guys are the ones that help with the overflow, the difficult lanes, and the last minute emergency runs. The little guys can be life savers. Therefore, Tropicana felt it important to recognize HG Logistics LLC. They expressed their appreciation for our services by giving us this award. HG Logistics LLC could not have accomplished this honor without the attentiveness of our Account Manager, Diana Trusty. Diana has done as excellent job overseeing not only the Tropicana account, but the needs of all her customers as well. In addition, HG Logistics LLC cannot overlook the role of our dispatchers who worked diligently to cover these loads.